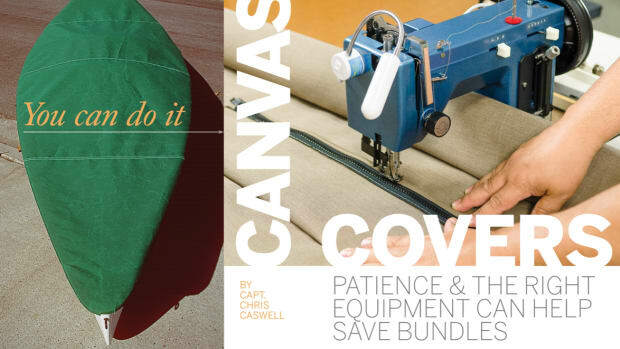 This article first appeared in our sister publication, Sail Magazine. While written for a sailing audience the basic know-how of this article translates easily to the trawler crowd and boating crowd in general. See the original article here. 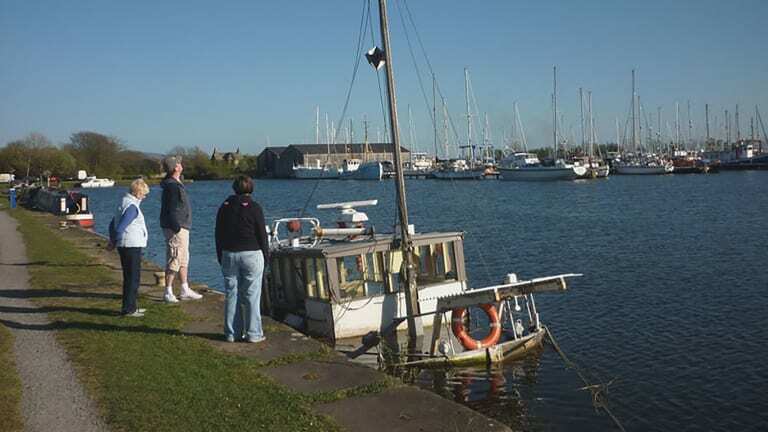 A leaky hose was all it took to send this boat to the bottom at her slip. Without much reflection, I recently replaced my broken bilge pump with a slightly larger model. After all, I thought, surely an 800 gallon-per-hour (gph) pump will outperform the previous 500gph unit? Well, yes, but that’s no reason to feel much safer, as I soon discovered. The reason is that no pump is designed to deliver its rated output for long—at least not in real-world scenarios. And even a modest breach in the hull is likely to overpower the pumps supplied with most boats—just look at ingress rates in Fig. 1. Small wonder that the Coast Guard attended over 1,100 distress calls last year to vessels taking on water. Part of the problem is that boatbuilders simply aren’t required to supply a system that can deal with damage control. 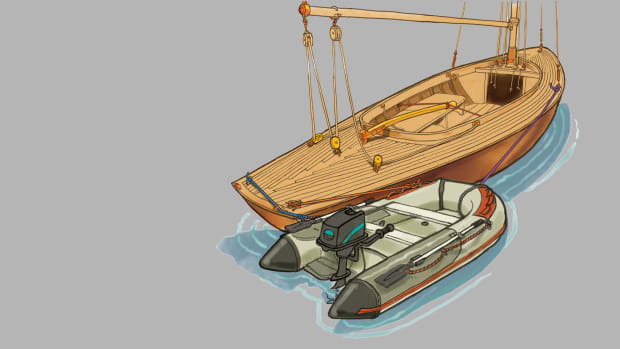 Between the strict requirements of the European Union’s Recreational Craft Directive and the American Boat and Yacht Council’s (ABYC) guidelines, boats only need to be equipped with a system to remove “normal accumulations” of water in the bilge—meaning occasional spray, rainwater or slow leaks. 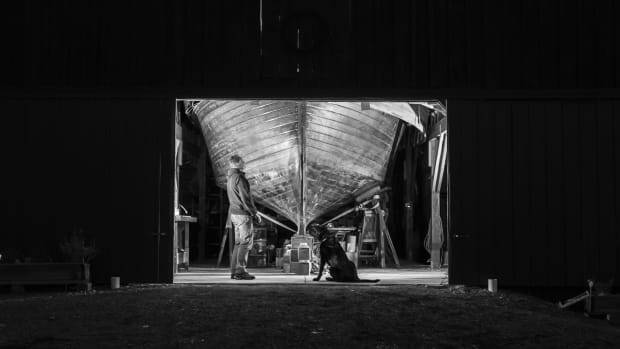 As ABYC technical standards specialist David Broadbent says, “Our construction standards are to create the safest possible boat, and we currently do not go into emergency procedures. 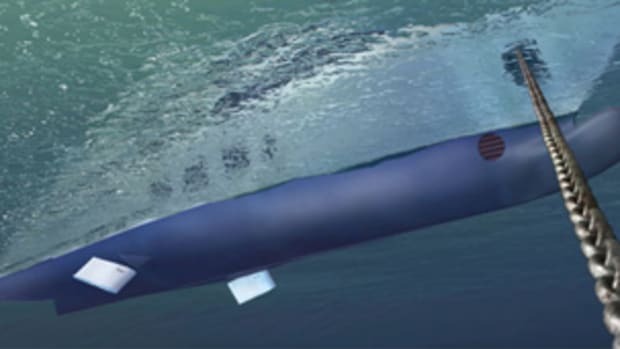 That being said, other standards such as H-27 for seacocks and through-hulls have specific requirements such as a 500lb test to help prevent issues like a sheered seacock.” In other words, to keep water out of the boat. These figures make stark reading. 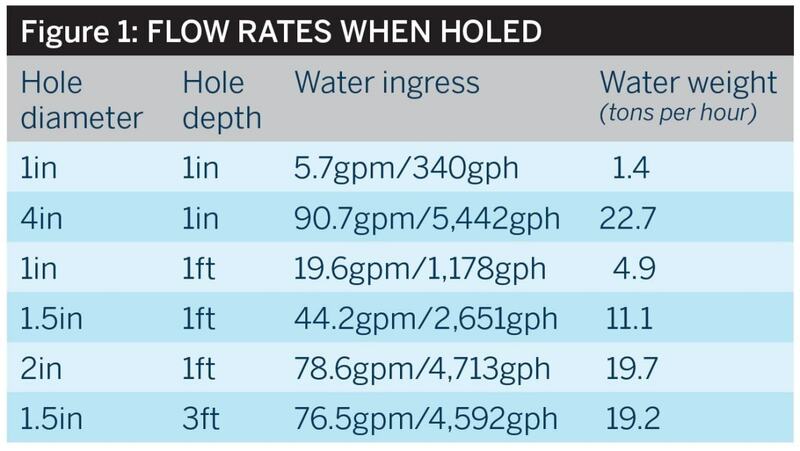 Modern yachts just aren’t equipped to deal with these flow rates by their manufacturers. One production 33ft cruiser I know of, for example, has a pump rated at roughly 520 gph. This would only just keep up with a small hole at the waterline, in the least serious of our scenarios. Surprisingly, I’ve also come across 50ft offshore cruisers with almost identical pumps. Indeed, in reality, most installations will be using battery voltage of around 12.5V, involve a piping run full of bends, elbows and joints, and deliver the bilge water to an outlet well above the pump itself. All this chips away at the pump’s performance. Most sailboats operate on a nominal 12-volt system, using lead-acid batteries. The chemistry of these batteries means that they run at 13.6 to 14.4-volts only when hooked up to shorepower or when charging on the engine’s alternator. Otherwise, the voltage in the system drops according to the battery’s state of charge—12.7V would indicate a fully-charged battery in mint condition, dropping to 12.4V at 75 percent charge, 12.2V at 50 percent and so on. Lower voltage means lower performance, so in an emergency, even with your battery fully charged, your pump is already about 6 percent off its stated output. Old, tired batteries could further reduce output by as much as 10 percent—all because of the lower voltage. In addition, if your cables are too small for the length of the wire run, the pump can suffer yet more voltage drop causing the loss of yet more precious output. Manufacturers are aware of this issue, but only Xylem Flow Control appears to be tackling it, re-rating the pumps in its Rule line based on likely output at real-life voltages. “Hopefully, our competition will follow suit,” says product manager Michael Irving. Beware of water siphoning back aboard when the boat is well heeled. 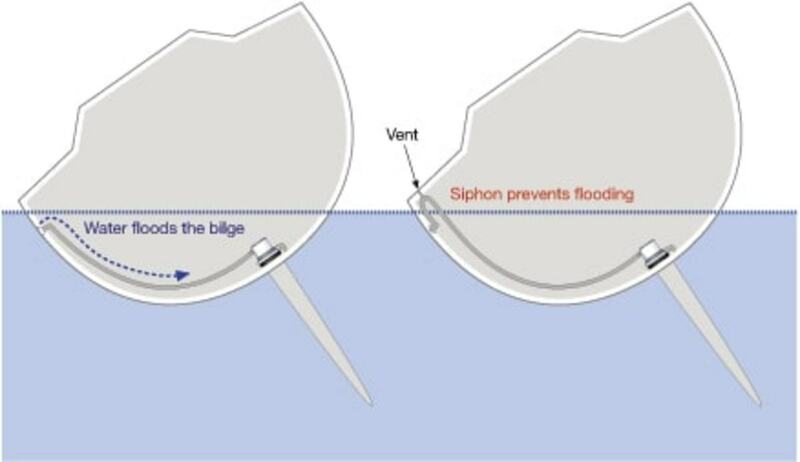 Next, you need to consider that bilge water collects below the waterline, but you will usually want to discharge it above that same level. The height above the pump that the water must be raised is known as the “head,” and every extra inch sees gravity increase the pressure at the base. This fights the opposing pressure exerted by the pump, reducing its output. The Rule 2000 is an example of a typical small-boat bilge pump (left); Low-profile pumps like this one from Whale work well in tight spaces (right). Then there’s the final piece in this puzzle, the pipe run. Because every bend or kink adds friction to the system and reduces output, you want as simple a run as possible between the pump and the outlet, using smooth hose, not the corrugated stuff often sold as bilge pump hose. 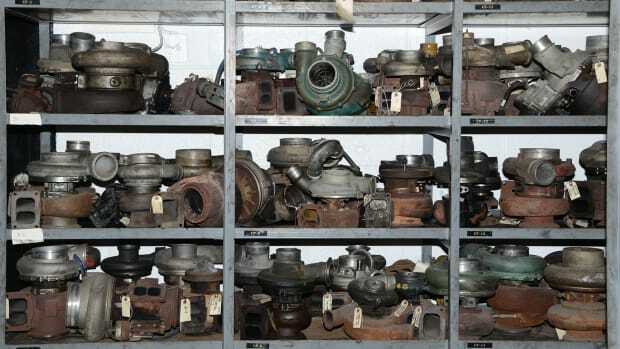 Some experts also advise against using non-return valves. Instead, put a vented loop in the line that will always be above the waterline, even when the boat is heeling hard. The vent prevents water siphoning back into the bilge, eliminating the need for a valve. Shown are the many factors that affect pump performance in the real world (left); The greater the “head,” the less the output; note, this is a two-pump system (right). Faced with this reality, your first step should be to determine what your existing pump’s real-world output is by measuring the volume it removes over a set time of say, one minute. Multiply this number up by 60 to get the rate per hour. Bear in mind that a combination of lower battery voltage, discharge height and bends in the piping could easily result in an output that is less than half the pump’s rating. Next, take a look at the “water ingress” table to see what kind of scenario you want to protect yourself against. Let’s say you have 1.5in diameter seacocks situated 3ft below the waterline; you might want to be able to deal with 4,600 gph—the rate at which water would flood in through a failed through-hull. Now allow for the 6ft rise to the pump outlet, some inevitable voltage drop and friction in the system, and you can see that you need around 8,000 gph of pump capacity on board. Although Rule manufactures an 8,000 gph emergency pump, the Evacuator, you might be better served by two 4,000 gph pumps—a size produced by all the major manufacturers. Ask yourself where you would need them if the hull were breached—for example, at the lowest points of the bilge or on either side of any bulkheads that don’t allow free flow. Similarly, if you can simplify your pump’s pipe run to reduce friction in the system, great, although, much piping on today’s boats is bonded in and hard to reach. 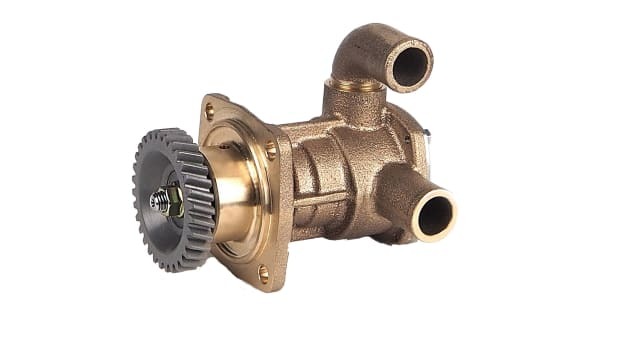 Also check that there are no superfluous Y-valves, connectors or reducers in the system and that the skin fitting is no smaller than the pump’s outlet. With this in mind, Pascoe advises boatowners install two pumps at each location: one unit higher than the other. In this configuration, the lower one is a smaller-capacity pump on an automatic switch that keeps day-to-day bilge water undercontrol, with the other only switching on if the first is not keeping up. Take care with any automatic pump, though, as another major cause of failure is the float switch. Specifically, keep your bilge clean of debris and make sure that pipework or wires are kept clear, allowing the switch to operate properly. 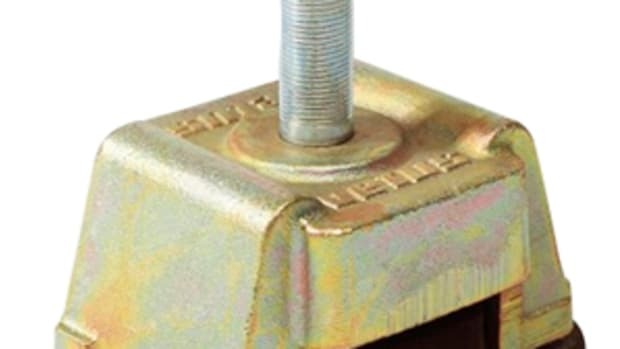 Also note that a new breed of field sensing switch is also now banishing unreliable float switches to the history books, although even here you should be careful, as there are reports of poor waterproofing around the electrical connections. 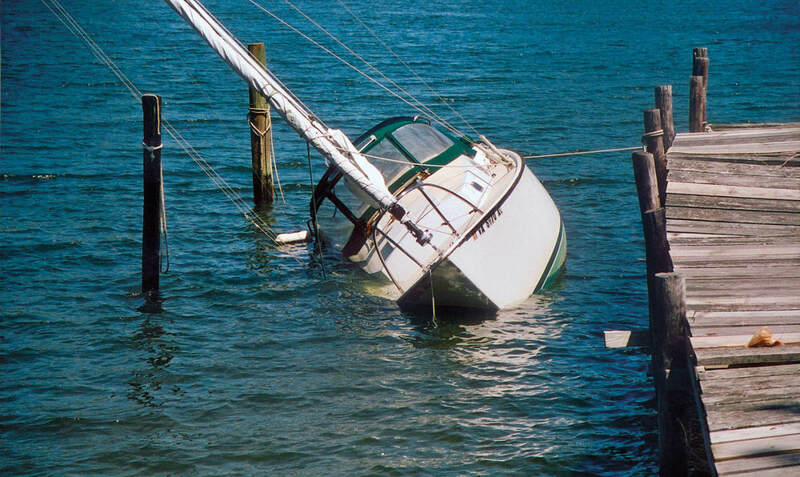 If all this seems like a lot of bother over an unloved part of the boat, just remember that proportionately more sailboats run into problems at sea than power boats—and all because just one pump really isn’t enough. Some surveyors recommend cruising sailors install a clutch-operated bilge pump that runs directly off the boat’s engine. That way, you’ll have a reliable, high-capacity pump that requires no fickle electrical connections. (Large electric pumps can draw 20-30amps, so it’s likely that you’ll need to run the engine anyway.) Xylem makes a range under its Jabsco brand, which runs from 1,470 gpm to 4,100 gpm. They run off a belt and pulley attached to the engine’s crankshaft, just like the alternator, with a manual clutch to engage and disengage. 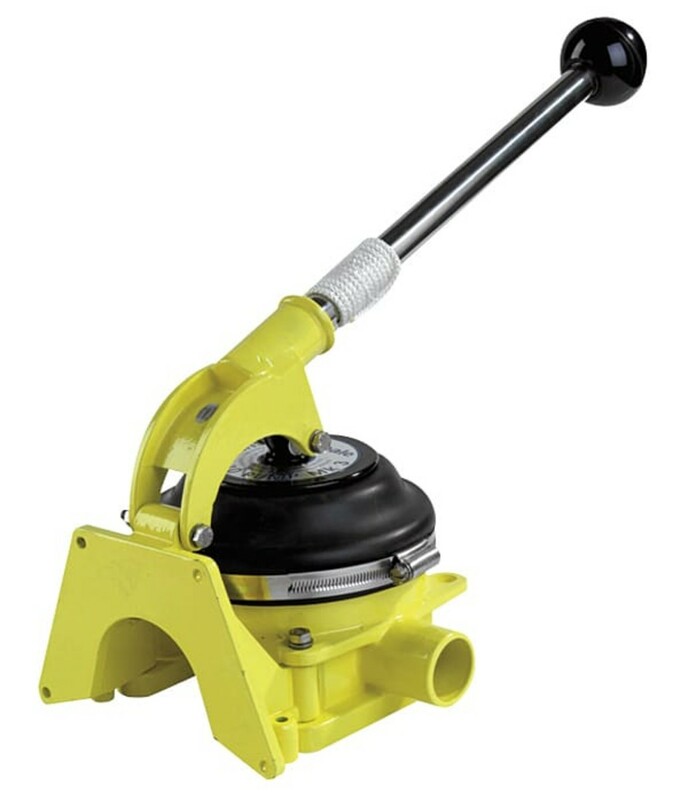 Some manufacturers say that a manual bilge pump should be fitted for damage control. 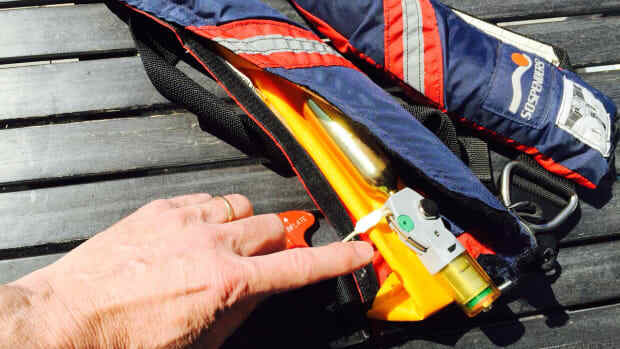 “During an emergency situation, there is a potential for the boat’s electrical system to be flooded, causing the pump to cut out,” explains Claire McCrea of Whale Pumps. 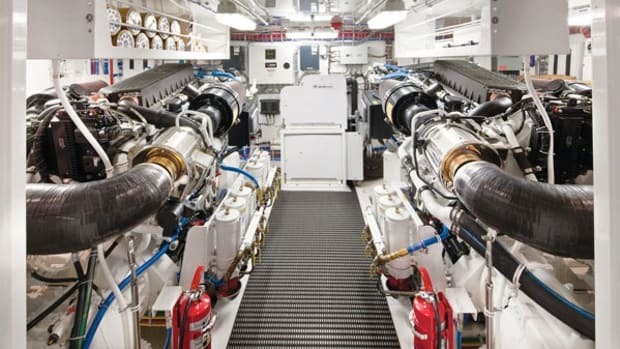 “Best practice is for a manually operated bilge pump to also be fitted on board.” That said, Whale’s largest manual pump, the Gusher 30, shifts only 1,200 gph, while Edson’s well-regarded DD120 can manage 1,800 gph. In addition, a person in an emergency situation, even with adrenaline coursing through his or her veins, will not keep up for long with the 30 to 70 strokes per minute required by these high-capacity pumps. It can also be difficult to find somewhere to install them. It is, therefore, not uncommon for them to simply be mounted on a board, with a long lay-flat discharge hose, so that they can be used either above or belowdecks. Another option is a standalone gasoline-powered pump, like Honda’s WX10TA, which can shift 1,920 gph through its 1in discharge hose. This article first appeared in Sail Magazine&apos;s December 2018 issue and is reprinted here with permission. If you&apos;d like to comment or participate in discussions on this article please visit the original article at sailmagazine.com.